Andrew Benvie was well respected and civic minded. 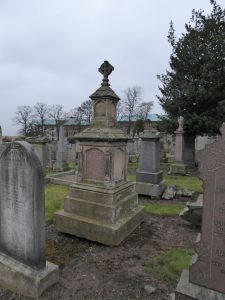 When he died, the value of his estate was over £8,000, including shares in Dundee Gas Light Company and Scottish North Eastern Railway. He left a legacy of £1000 to Dundee Royal Infirmary. At the time of his donation, Andrew Benvie was a retired linen merchant and manufacturer. Andrew Benvie became a linen merchant and manufacturer. He began his early working life as a "stamper." After some time in that role, he was appointed one of a number of inspectors whose duty it was to inspect the cloth manufactured in Dundee. Warden suggested in "The Linen Trade Ancient and Modern" - "that for several years after the repeal of the 'Stamp Act' (1823), a system of inspection was in operation, but it was entirely voluntary, there being no law to enforce it. The inspectors, in most cases, were the same parties who had acted as stampers under the Act, and they were generally well qualified, from their knowledge and experience in examining linens, for being inspectors." He then began to sell goods on commission, becoming one of the partners in the firm of Messrs James Spankie & Co. On the 24th September 1830, Andrew Benvie was admitted a free master of the Bonnetmaker Trade. 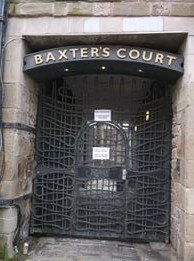 In 1834 he was still "of James Spankie & Co, Peter Street, Dundee" and from then on he appears to have been working on his own account, firstly as a merchant and partner of Cochrane and Benvie, 131 Seagate, Dundee and then as a tenant/occupier, linen merchant and manufacturer in the Cowgate. In 1837, Andrew Benvie was the owner of a schooner called Pilot and by 1842 he also had a schooner called Liverpool. The copartnery of "Messrs Cochrane and Benvie" was dissolved with mutual consent in October 1845. George Cochrane continued operating from the same premises under the firm of "Cochrane & Co." In 1851, Andrew Benvie was on the Nine Trades Committee. A commemorative plate was found during extensive alterations and improvements to the ground floor of the Trades Hall. The Plate is in the custody of McManus Galleries with a plaque detailing the members of the committee. In 1854, he was elected a Town Councillor for the Third Dundee Ward and served on various committees until 1857. In 1861, he retired. Andrew Benvie was born to George Benvie, cloth manufacturer and Elizabeth Wilkie in Abernyte, Perthshire. He married Jean Doig on 1st July 1823. He and his wife had seven children, 6 of whom predeceased them and were buried in the “old graveyard,“ the Howff, Dundee. His daughter Mary was the only one to outlive them and continued to live in Napier Place, Nelson Street. 1794. Benvie, Andrew. (Old Parish Registers. Births. 327/10296 20/01/1794 Abernyte). ScotlandsPeople website. 1823 Andrew Benvie/Jean Doig. Old Parish Registers. Marriages. 282/21090. Andrew Benvie/Jean Doeg. Dundee. 01/07/1823. ScotlandsPeople website. Benvie/Doig. (Old Parish Registers. Births. 282/Dundee) ScotlandsPeople website. Dundee Post OfficeDirectory, 1834, p.6. Printed and Published by Archibald Allardyce, Dundee, Dundee City Archives. Dundee Post Office Directory, 1837-38, p.8. Printed and Published by James Chalmers, Dundee, Dundee City Archives. Dundee Post Office Directory, 1842, Dundee, p.9. Dundee City Archives. Dundee Post Office Directory, 1845, p.9. Printed and Published by Dundee Advertiser, Dundee, Dundee City Archives. Dundee Post Office Directory, 1845, p.19. Printed and Published by Dundee Advertiser, Dundee, Dundee City Archives. Dundee Post Office Directory, 1850, p.76. Printed and Published by James Chalmers, Dundee, Dundee City Archives. Dundee Post Office Directory, 1853-54, p.136 including Lochee, Broughty Ferry, Tayport & Newport. With a history of Dundee by James H. Donnan. Dundee: A. M. Stephen, James Chalmers et al, Dundee City Archives. Dundee Post Office Directory, 1861-62, p.116. Printed by Bowes Brothers, Dundee City Archives. Dundee Post Office Directory, 1858- 59, p.106. Printed and Published by Hill & Alexander, Dundee, Dundee City Archives. Dundee Post Office Directory, 1861-62, p.240. Printed by Bowes Brothers, Dundee City Archives. Dundee Post Office Directory, 1864-65, p.97. Printed by James P. Matthew Dundee City Archives. 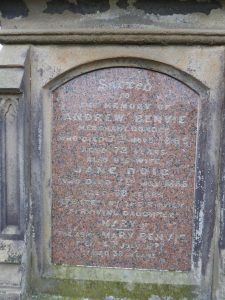 1865 Benvie, Andrew (Statutory Registers Deaths 1865 282/1 1168) ScotlandsPeople website. Lair purchased by Mr Andrew Benvie, Merchant, Nelson Street Register volume 3, Register number 849. Friends of Dundee City Archives, Western Burial Lair Records p.18 of 48. Dundee Post Office Directory, 1850, p.5. Printed and Published by James Chalmers, Dundee, Dundee City Archives. Dundee Post Office Directory, 1834, p.115. Printed and Published by Archibald Allardyce, Dundee, Dundee City Archives. Dundee Post Office Directory, (1834), p.118, Printed and Published by Archibald Allardyce, Dundee, Dundee City Archives. Dundee Post Office Directory, 1856-57, p.15. Printed by Charles D. Chalmers, Dundee Local History, Dundee Central Library, Wellgate, Dundee. Dundee Post Office Directory, 1850, p.272. Printed and Published by James Chalmers, Dundee, Dundee City Archives. Dundee Post Office Directory, 1853-54, p.54 including Lochee, Broughty Ferry, Tayport & Newport. With a history of Dundee by James H. Donnan. Dundee: A. M. Stephen, James Chalmers et al, Dundee City Archives. Dundee Council Minutes, 16th November 1854, p.90. Dundee City Archives. Dundee Council Minutes, 16th November, 1854, p.91. Dundee City Archives. 1865 Benvie, Andrew. (Legal Records, Wills and Testaments 11/12/1865 Dundee Sheriff Court SC45/31/19) ScotlandsPeople website. Dundee Post Office Directory, 1840, p.7. Printed and Published by James Chalmers, Dundee, Dundee City Archives. Dundee Advertiser, 8 November 1865. British Newspaper Archive website. Warden, Alexander J. (1864). The Linen Trade, Ancient and Modern. London: Longman. p.474. Nine Trades of Dundee Lockit Book (1664- 1965) Bonnet Makers, p. 19. Dundee Post Office Directory, 1837-38, p.110. Printed and Published by James Chalmers, Dundee, Dundee City Archives. Dundee Post Office Directory, 1842, p.138. Printed and Published by James Chalmers, Dundee, Dundee City Archives. Dundee, Perth & Cupar Advertiser, 21 October 1845. British Newspaper Archive website. Phillips Parry (n.d.). Nine Trades of Dundee. Retrieved from ninetradesofdundee.co.uk. 1861 Benvie, Andrew. (Census 282/1 24/2) p.2 of 79. ScotlandsPeople website. 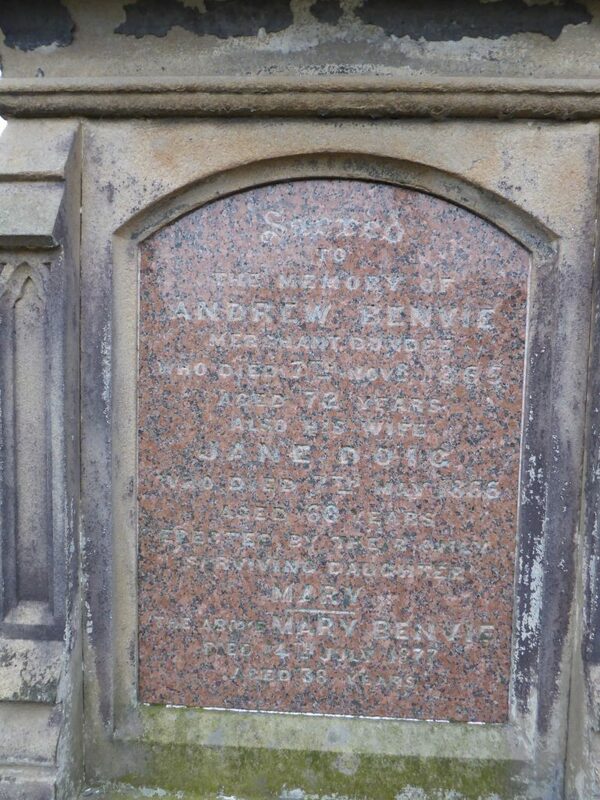 1823 Andrew Benvie/Jean Doig (Old Parish Registers Marriages 150/301 01/07/1823 Dundee), ScotlandsPeople website. Inscription on face of Andrew Benvie's gravestone in Western Cemetery, Dundee. Burial Records of the Dundee Howff, pp.31-32 of 40. Friends of Dundee City Archives. 1865 Benvie, Andrew (Valuation Rolls VRoo9800015-/80, Dundee Burgh) p.80. ScotlandsPeople website. Millar, A.H. (January 1925). Glimpses of Old and New Dundee. M.C.MacLeod. Dundee. Dundee Courier. 8th November 1865, p.2. Dundee Central Library, Local Studies, Wellgate. Thanks to: The staff at Local History, Dundee Central Library, Wellgate, Dundee. The staff at Dundee City Archives, 14 City Square, Dundee. The information above about Andrew Benvie has been collated from a range of digital and hard copy sources. To the best of our knowledge it is correct but if you are relying on any information from our website for the purpose of your own research we would advise you to follow up the sources to your own satisfaction. If you are aware of an inaccuracy in our text please do not hesitate to notify us through our Contact page.